In our capacity as a development organization, we react swiftly to natural disasters in partner countries. 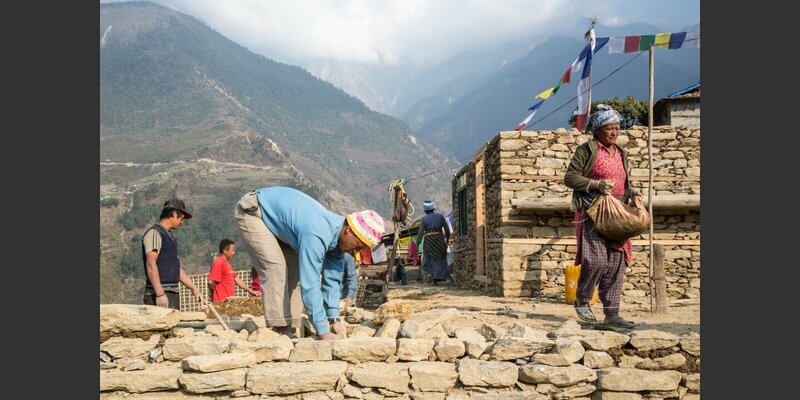 In Nepal, for example, Helvetas combines reconstruction after the 2015 earthquake with vocational training, thus contributing to sustainable development. These projects are funded by donations and Swiss Solidarity. Earthquakes. Droughts. Tropical storms. Like other international organizations and multinational companies, we are also confronted with natural disasters in partner countries. After the first shockwave, Helvetas experts on location and in Switzerland plan an humanitarian response. What is the government doing about the situation? What are other organizations doing about it? How can we make the most of our own structures and connections to help out in the regions affected? Can we let others use our structures? And what can donors in Switzerland do to help? So it was after the earthquakes hit Nepal in April and May 2015, killing nearly 9,000 people and destroying over 600,000 buildings. As our first humanitarian response, Helvetas staff brought badly needed tarpaulins, medicine and food to the Sindhupalchok and Gorkha regions, where we have been carrying out development projects for many years now. We began reconstruction efforts a few weeks later, working closely together with the Swiss NGO Solidar Suisse. We repaired damaged water supply systems. We had local experts develop a model house made of dry masonry and wood that is more likely to withstand future quakes. The 300 local experts required for this purpose were trained on the job, which constitutes a contribution to the country’s development that goes far beyond an humanitarian response. Experts were also trained to rebuild 34 schools, a project initiated by Helvetas and Caritas Switzerland. 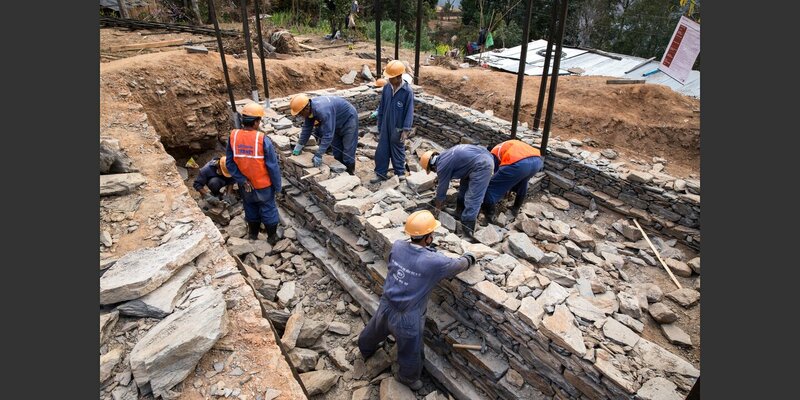 Latrine builders and plumbers equipped the new schools with functional water supply systems and latrines. Furthermore, Helvetas arranged for the repairs to the damaged suspension bridges that had been built in a previous Helvetas project. In a project to promote organic fair trade coffee, 50 processing facilities with pulping machines were repaired as well. The fact that Helvetas combined reconstruction with development aid was noted and highly appreciated by other organizations: the UK Secretary of State for International Development commissioned Helvetas to train 6,500 masons and 1,000 carpenters to build safe houses – which gave the project a wider focus on development cooperation. Helvetas funded its humanitarian response in Nepal using donations as well as contributions from Swiss Solidarity (known in Switzerland as Glückskette), a fundraising foundation for humanitarian relief.